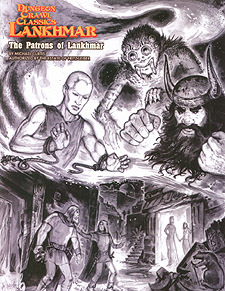 This early look at the upcoming Dungeon Crawl Classics Lankhmar line introduces a half-dozen supernatural powers and eerie entities for use in your DCC RPG or Lankhmar campaign. Each power's entry includes details on the entity and their role in Nehwon, tables for invoking that power's aid, corruption charts for when things go wrong, and new spellburn possibilities. Are you ready to serve the Patrons of Lankhmar?